John cast the two spells of the game—first, a Sword of War and Peace and then a Hero of Bladehold a turn later, but the latter was Dissipated by Christian. John had a Thrun a turn later, and Christian had no choice but to let it go. Thrun took up the Sword of War and Peace. 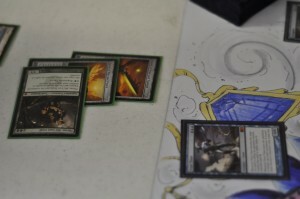 Christian flashed in a Snapcaster Mage targeting nothing relevant in order to stop the beatdown from Thrun. Looking for an answer, Christian had to cast a Frost Titan, tapping down a Razorverge Thicket. John kept up the Thrun beatdown by casting a Sword of Feast and Famine and attaching it to Thrun. 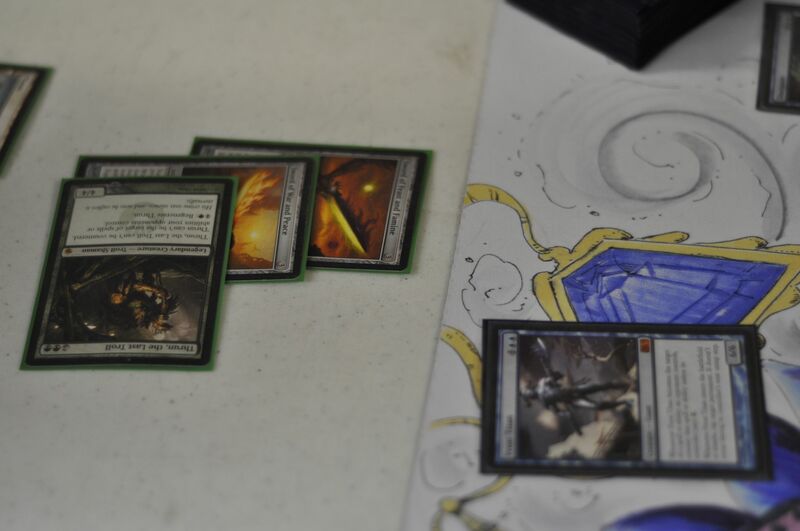 Luckily for Christian, the Frost Titan was the only color that Thrun did not have protection from—blue. Attacking with Thrun, John told Christian, “Frost Titan chump blocks, I assume?” but surprisingly Christian chose to take the damage, falling all the way down to 9, the extra 3 damage courtesy of Sword of War and Peace. Using his extra mana, John ridded the Frost Titan with a Beast Within, the beast a color that Thrun had protection from. Christian had a Forbidden Alchemy, but nothing else during his turn. A stacked Thrun swings in past Christian's Frost Titan. John continued the beatdown by casting a Primeval Titan. Christian flashed in a Snapcaster Mage, flashing back a Mana Leak, stopping the Titan but also providing a chump blocker for the massive Thrun. Christian still looked for an answer, flashing back an Unburial Rites to bring back a Snapcaster Mage to flash back a Forbidden Alchemy. A Timely Reinforcements from John netted him 3 Soldiers, and once again Christian’s Snapcaster Mage was sacrificed to block the massive Thrun from attacking Christian’s life total. equipped with Sword of Feast and Famine took Christian down to 6 life while Thrun was chumped by the Sphinx. Christian cast another Consecrated Sphinx, but John took it out with another Beast Within. “Let’s go to Game 3, too many Swords on the Field.” Christian said as he picked up his cards.